Juno award nominee for best blues album of the year, James Buddy Rogers will perform on the Nanaimo St stage (12:30pm) followed by Canadian Harmonica player of the year, Harpdog Brown (2:30-4:00). Starting off the day will be local politico Chuck Puchmayr and the Blue Express. On the Edinburgh street stage we have the Russian blues guitar sensation Arson Shomakhov along with popular children’s entertainer IshdaFish. 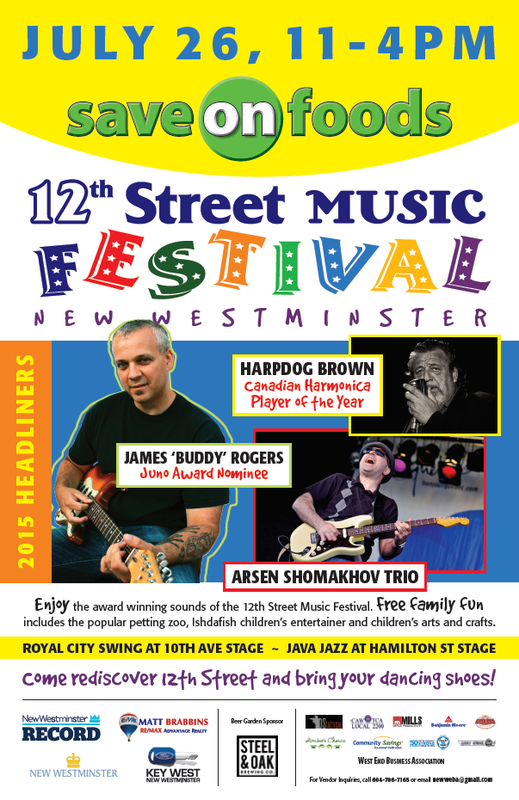 Java Jazz will host a stage at Hamilton Street and present a nonstop jazz, hip-hop and dance party throughout the day. At the 10th Avenue stage you may swing to your hearts content with the Royal City Swing who will feature Deanna Knight and the Hot Club of Mars. This has truly become one of the premier free family festivals in the Lower Mainland, and continues to grow in quality and interactivity for all. Children’s entertainer IshdaFish, a petting zoo, interactive crafts with the New Westminster Arts Council and Glembooke day care, fire and police command centre tours and many many vendors. Thanks to the generous sponsorship of save on foods, media sponsorship of the Royal city Record along with the City of New Westminster, this will truly be, as Ed Sullivan use to say, “a really big show”. This year a refreshing adult garden sponsored by the local success stories Steel and Oak brewery and Pacific Breeze Winery.